Have you ever thought that your technology is acting more and more like an oracle? Last week, I was having a mini-meltdown about the intersection of my business beliefs with my heart beliefs, when…Ta-Da!…The mystical Google genie magically popped this picture up on my screen. This phrase Love Made Me Do It is not an excuse for wild abandon — it speaks to the driving force that brings passion into our lives. Love is a loaded word. Love can mean: a feeling that you place upon another being, or hopefully, yourself. Love is sometimes seen as a state of ecstatic joy, yet love also refers to a quiet state of mind and an inner glow of contentment. Most importantly, and perhaps most overlooked: Love is the governing force that infuses every choice that you make in your life. That’s why this photo is currently my desktop screensaver. Each time I see the photo, it reminds me that my driving passion — what I love — is to share about the profound healing that comes from using the creative process for self-discovery. Love is the force that inspires me (and you) to follow our dreams, and to hold on to the vision of hope. Hope that each of us can help change the world, simply by trusting in the powerful life force called LOVE. What is Love calling you to act on? What is Love motivating you to share? Below is a link to Love Made Me Do It! 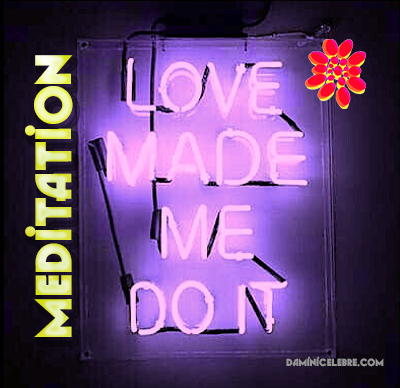 meditation to help you connect with your heart, and to connect with what you love.